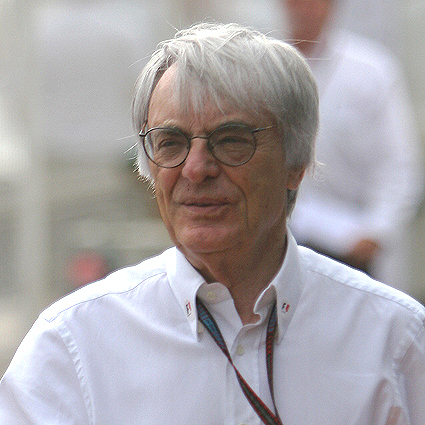 London, May 10 : The jailed German banker, who has accused Formula One CEO Bernie Ecclestone of bribing him to secure the sale of a Formula One stake, has reportedly testified for the first time at the corruption trial of the F1 boss. Ecclestone, who is accused of paying a bribe of 44 million dollars to Gerhard Gribkowsky to secure the sale of a stake in the F1 business to a company he favoured, admitted making the payment but claimed he was blackmailed into it. London, Jan 16 : Following his indictment on bribery charges in Germany, Formula 1 chief executive Bernie Ecclestone has stepped down from the company's board but will continue to run the sport. A Munich court Thursday decided to put the 83-year-old on trial for allegedly bribing German banker Gerhard Gribkowsky with $45 million before the sale of a stake in F1 in 2006. The trial will take place most likely in April and Ecclestone will not be part of the board until the case is resolved. London, Oct 25 : Formula One boss Bernie Ecclestone (78) has found love once again and is dating a motor racing executive nearly 50 years younger to him. Bernie admits that his romance with Fabiana Flosi, 30, his first girlfriend since splitting from his wife 11 months ago, is off to a flying start. London - Grand Prix supremo Bernie Ecclestone does not yet consider Formula One team Renault guilty of cheating, he said in an interview published in the Daily Mail on Saturday. "That the FIA World Motor Sport Council has become active does not mean that Renault is guilty," he is quoted as saying. Renault is accused of deliberately instigating a crash at last year's Grand Prix in Singapore, which Alonso won after he was the only driver to have undertaken a fuel stop before the safety car phase. The case is to be heard on September 21. Nuerburg, Germany - Formula One supremo Bernie Ecclestone has cancelled a planned visit Thursday to the opening of a new leisure centre at the Nuerburgring circuit ahead of this weekend's German Grand Prix, the company that runs the track confirmed Tuesday. The Nuerburgring GmBH company refused to give reasons for the cancellation, saying only that the 78-year-old had informed it of his decision in a phone call. Ecclestone has suffered sustained criticism following comments made last Friday to The Times newspaper where he praised Adolf Hitler for his ability "to get things done." London, July 7 : Formula One commercial rights holder Bernie Ecclestone has claimed that there has been a "big misunderstanding" over his comments about Nazi dictator Hitler that appeared in the press over the weekend. Ecclestone had said that Hitler was a "man who could get things done" during an interview in which he expressed strong views on dictators. F-1 chief Ecclestone likes the way Hitler got things done! London, July 4 : Formula One chief Bernie Ecclestone has said that he preferred totalitarian regimes to democracies and praised Adolf Hitler for his ability to “get things done”. In an outspoken interview with The Times, the 78-year-old billionaire chastised contemporary politicians for their weakness and extolled the virtues of strong leadership. London - Bernie Ecclestone will not let the bitter feud between eight teams and the world governing body FIA destroy his decades of work in Formula One. "I have given 35 years of my life and more to Formula One. My marriage broke up because of Formula One, so I am sure as hell not going to let things disintegrate over what is, in the end, basically nothing," Ecclestone told Monday's edition of The Times daily. Ecclestone, 73, is responsible for the commercial side of the sport and has generated millions from marketing and television. Barcelona - Formula 1 supremo Bernie Ecclestone has indicated he would protect Ferrari in a dispute with FIA president Max Mosley over the introduction of budget caps. Ferrari president Luca di Montezemolo has been critical of new budget cap guidelines, leaving Mosley to say Saturday Formula One "could survive without Ferrari." Ecclestone told the Times newspaper published Monday he would not let Mosley "destroy" di Montezemolo.